There is something about chilli and chocolate that sounds very exotic and makes us think of the Incas. It's a romantic combination in theory but so often in reality doesn't quite work for me. Even on the occasions where I've had good bars of chilli chocolate, there still hasn't been a bar where I've thought; "this is it" and switched from chocolate without. Consequently when I saw these new biscuits in Marks and Spencers I was a little wary at first. Had it not been for this blog I wouldn't have popped them into my basket. Foodstuff Finds has a way of making you pick up foodie products you'd otherwise turn your back on! So with some apprehension I opened up the pack. 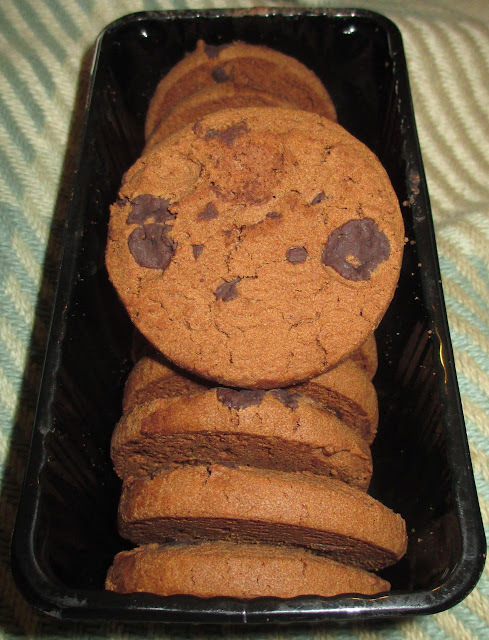 First thing to note is just how much chocolate there is in these cookies. They are packed with chunks of dark chocolate. The biscuits are quite big, but the texture is a light crunch. They sort of melt in the mouth when you bite it, rather than being heavy and stodgy. The flavour at first is purely that of chocolate and biscuit. The chocolate is of a very impressive quality, very dark with some lovely distinct tones of cocoa. The sweetness balance, once combined with the biscuit, is spot on. So what of the chilli, well as first I thought there wasn't any, but the chilli appears in the aftertaste. It's very mild at first, but does develop and give a bit of a kick to the back of the throat and a bit of a buzz on the tongue. If I'm honest I've had ginger biscuits that are stronger, but I still wouldn't want any more chilli. In its light dose its fine, it does its job adds a dash of heat but isn't too intrusive. I liked these biscuits, I liked them far more than I thought I would, but I can imagine chilli aficionados being very unimpressed. 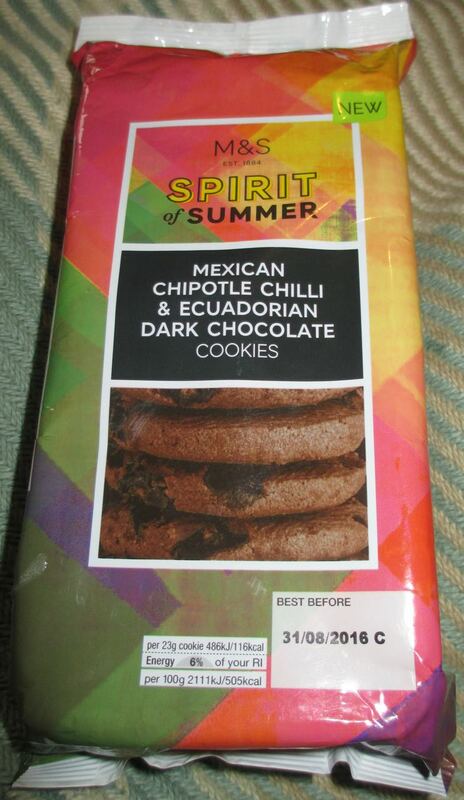 My only negative point is that these are in the "Spirit of Summer" range, and these are dark rich and warming biscuits. Do Marks do a "Spirit of Winter"? If they did these would be better in that range instead.